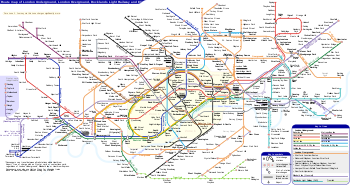 A topological tube map of the London Underground system. Also included are the متروی زمینی لندن، قطار سبک داکلندز، ترام‌لینک، و کراس‌ریل systems for integration purposes. متروی لندن در سال ۱۸۶۳ میلادی تأسیس شده‌است که هم‌اکنون دارای ۱۱ خط، ۲۷۰ ایستگاه و ۴۰۲ کیلومتر طول می‌باشد. † ^ Some stations are assigned to multiple zones. People travelling through these stations may treat the station as in whatever zone makes their fare the least expensive. ↑ The other names listed may have been used previously on station signage, on network maps, in advertisements or in planning material – Harris, Cyril M. (2006) . What's in a name?. Capital Transport. ISBN 1-85414-241-0. In the early years, slightly different names were sometimes employed contemporaneously for different purposes or on different parts of a station. A number of stations continue to bear obsolete early names where these form part of the physical architecture. For example, the platform wall tiling at ایستگاه متروی آرسنال، ایستگاه متروی همپستید، ایستگاه ماریلبون and ایستگاه متروی خیابان وارن still carries the original names of these stations. ↑ ۲٫۰ ۲٫۱ Bank and Monument operate as a combined station with shared usage statistics. ↑ ۱٫۰۰ ۱٫۰۱ ۱٫۰۲ ۱٫۰۳ ۱٫۰۴ ۱٫۰۵ ۱٫۰۶ ۱٫۰۷ ۱٫۰۸ ۱٫۰۹ ۱٫۱۰ ۱٫۱۱ ۱٫۱۲ ۱٫۱۳ Rose, Douglas (1999). The London Underground, A Diagrammatic History. London: Douglas Rose/Capital Transport. ISBN 1-85414-219-4. OCLC 59556887. ↑ All Usage statistics (total entry plus exits) are in millions per year for 2014 – "Multi-year station entry-and-exit figures" (XLS). London Underground station passenger usage data. Transport for London. June 2015. Retrieved 20 June 2015. .
↑ Dumayne, Alan (1998). Southgate. Sutton Publishing Limited. p. 44. ISBN 0-7509-2000-9. این صفحه آخرین‌بار در ‏۱۹ نوامبر ۲۰۱۸ ساعت ‏۲۰:۵۶ ویرایش شده‌است.